Another Successful Showcase at ACE 2016 | Chemtrac, Inc. 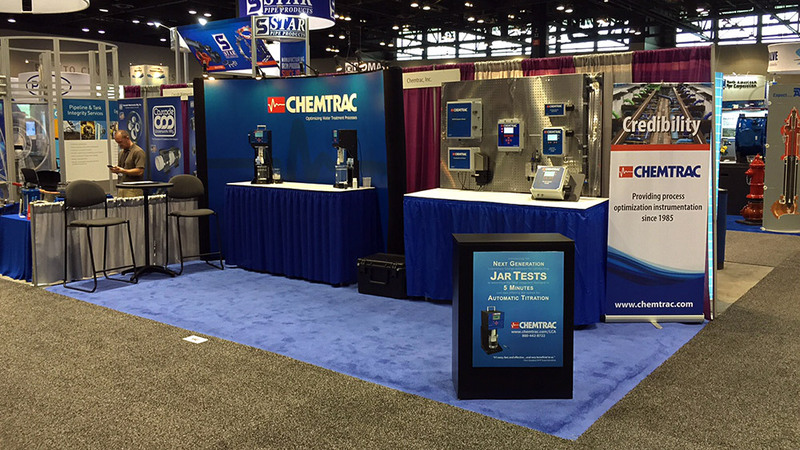 The Chemtrac team joined attendees at ACE 2016 in Chicago, IL to discuss the latest models of Streaming Current Monitors, Particle Counters, Chlorine Analyzers, and HydroACT multi-parameter analyzer. The Laboratory Charge Analyzer, a bench-top streaming current unit, was the featured product. As mentioned previously, the LCA builds on the success and solid performance of its predecessor models (CCA3100, ECA2100 and ECAT2100), allowing for charge neutralization titrations to accurately determine target coagulant dosages for surface water treatment. Essentially, the LCA provides a way for conducting jar tests in less than five minutes, as opposed to the traditional methods that can take in excess of an hour to run. Attendees were also able to learn about the new features of the recently released HydroACT controller/analyzer. This new model offers an innovative design, a high-resolution display, a user-friendly interface, and data storage and trend-graphing capabilities. The standard model will provide for two sensor inputs, with the ability to expand to eight sensors, for monitoring: streaming current, particle counts, chlorine, UV254 organics, pH, ORP, ozone, DO, conductivity, and more. This years conference was well attended with the Chemtrac staff feeling good about the responses it received from those that stopped by booth #1040. Thanks to all that were able to make it out.